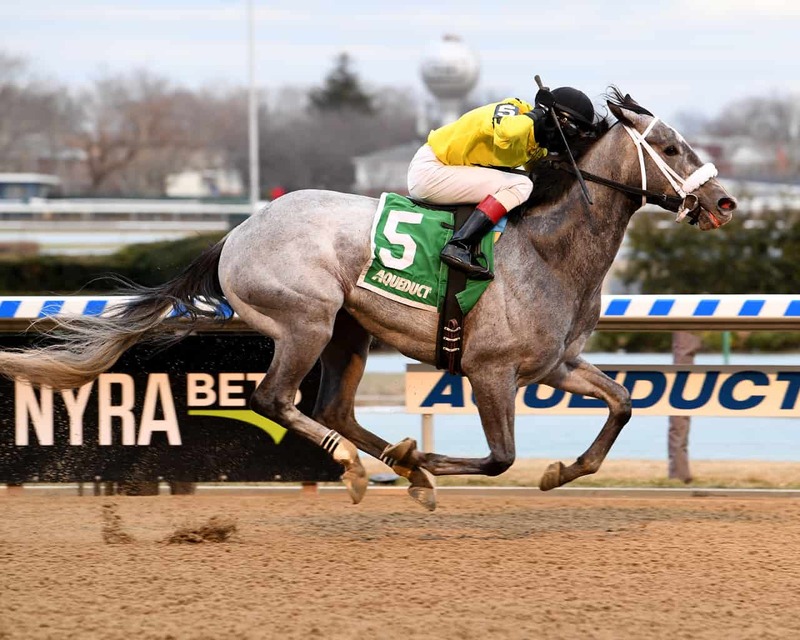 SOUTH OZONE PARK, NY – SJB Stable and Marcello Micozzi’s Skyler’s Scramjet broke through in fine fashion for his first graded score, taking Saturday’s Grade 3, $200,000 Tom Fool Handicap at Aqueduct. Breaking from post 5 as the 5/2 favorite under Trevor McCarthy, Skyler’s Scramjet stalked alongside Green Gratto through opening splits of :22.47 and :46.55. Taking the lead through the far turn, Skyler’s Scramjet quickly opened up a 4-length lead at the top of the stretch and then held off a late charge from Do Share to win by 1 1/2 lengths in a final time of 1:11.38 for the 6-furlong main track sprint. Do Share lingered near the rear of the field for much of the race before rallying late and finishing 3 lengths ahead of Great Stuff. Fourth went to Life in Shambles, with Classy Class, Spartiatis, Threefiveindia, Candid Desire, and Green Gratto completing the order of finish. Skyler’s Scramjet took his third straight at the Big A, following a pair of allowance wins for trainer Michelle Nevin. The 4-year-old son of Creative Cause improved his record to 10-5-0-0 with career earnings of $292,872. Skyler’s Scramjet returned $7.10 to win, $4.20 to place, and $3 to show. Do Share brought back $4.90 to place and $3.20 to show, while Great Stuff paid $2.80 to show.